Today, Australians are without a doubt more conscious of their health and fitness than ever before. Nationally, we spend $8.5 billion each year on gym memberships, sports equipment and the latest fitness trends, highlighting that we’re prepared to pay premium prices to achieve our health and fitness goals. As we become increasingly active and health focused, as well as more reliant on social media to consume news, be inspired and share our lives, the reach and engagement of fitness influencers has exploded. You might have recently seen that Kayla Itsines and Emily Skye have been included in the 2017 AFR Young Rich List (with a combined wealth of $78 million) emphasising the sheer value of the fitness influencer in today’s society. In addition to Kayla and Emily, FORWARD has pulled together a list of the 10 Australian Influencers you should be following for your workout fitspo. At just 26 years old she’s been named the world’s top fitness influencer by Forbes, but Kayla Itsines’ fitness empire has only just begun. Kayla’s fitness journey started back in 2008 when she decided to become a personal trainer and since then she has created a series of ebooks called Bikini Body Guides, a workout and meal-planning app, Sweat with Kayla, and held bootcamps all around the globe. Kayla likes to share transformation images of her BBG girls, nutritious meal inspiration and workout exercises. Kayla regularly endorses brands such as Adidas, Nike, Apple, Style Runner and Dyson, however she does not do sponsored posts. Kayla has been interviewed for publications including Women’s Health and Fitness, The Daily Telegraph, The Sydney Morning Herald, news.com.au, HuffPost as well as a range of top tier media titles from around the world including The New York Times, Forbes Magazine and Time Magazine. Emily Skye is a health and fitness guru and model, with a passion for getting people moving more, eating healthy foods and appreciating what their body can do. In her quest to show women of all ages and body types how to trim, tone and shape their entire body, Emily has developed a number of fitness products including, F.I.T Programs. These include video libraries of exercises (which can be done in or out of the gym) and nutritionist-developed meal plans. Emily also shares similar content on her social channels encouraging all women to lead active and authentic lives. Emily is currently a global ambassador for Reebok and Lucozade Sport. She regularly features in publications such as news.com.au, Daily Mail and Women’s Health, sharing her fitness advice and her own body transformations over the years. 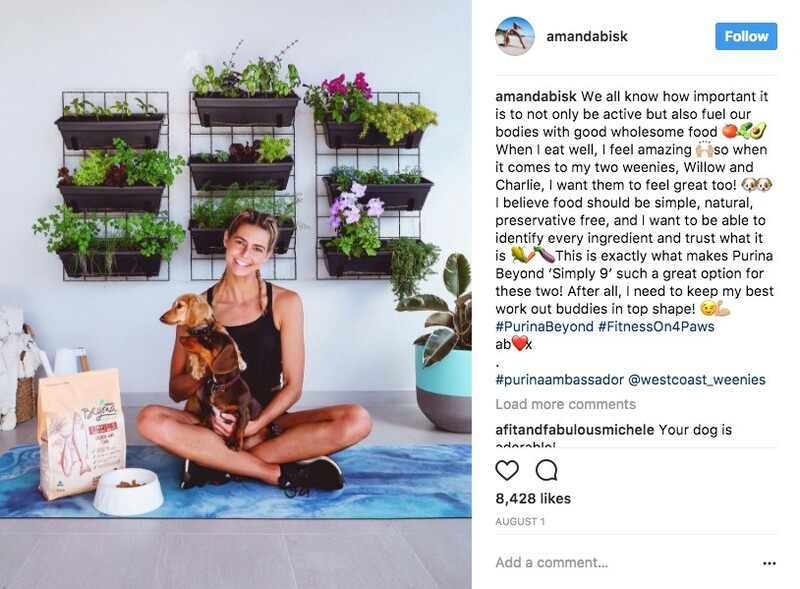 Amanda Bisk is a former Australian Pole Vaulter who discovered a love for yoga after being diagnosed with chronic fatigue. She found that yoga became an essential part of her life and the key to general wellness. Since then Amanda has become a qualified yoga teacher and has been sharing with her followers all the positive benefits of yoga. If that wasn’t enough, she’s also created a series of online fitness and flexibility programs called Fresh Body Mind Fit. She shares motivating and inspiring images of her healthy lifestyle on her Instagram. Amanda is the ambassador for H&M Sport, G Active Australia and has recently worked with brands including Qantas and Biotherm, and we were thrilled to work with her for the launch of Purina Beyond in July 2017. Amanda has shared her tips to a balanced and fulfilled life with the likes of WHIMN, Buro 24/7, Sporteluxe and POPSUGAR. Base Body Babes was founded by two personal training sisters, Diana Johnson and Felicia Oreb. Their goal? To inspire and motivate women to be as happy healthy, fit, strong and confident as possible. The pair have a passion to educate women on how to work out, eat healthily, get in shape and maintain it for life. In addition to their Instagram they also have their own blog, which they regularly share their fitness advice on. Base Body Babes are current ambassadors for Bare Blends and have previously worked with brands including Pantene, Swarovski and Natural Raw Company. Health and fitness has always been a part of Dan Conn’s life. After an impressive 10-year NRL career playing for the Roosters, Gold Coast Titans and Canterbury Bulldogs, Dan turned to training and nutrition after a neck injury sent him into an early retirement. This year, Dan became Wellness Director with the Collective Wellness Group (CWG) working closely with Anytime Fitness, Orangetheory Fitness and Massage Envy in developing healthy body and mind programs and contributing to digital content. Dan has worked with brands such as Mass Nutrition Bondi, AussieBum, Zeal Optics and Lenovo, and is currently an ambassador for Body Science. He has featured in the likes of GQ magazine, Men’s Muscle Health, Body + Soul and 9Coach, sharing his eating habits and workout tips. She’s the straight-talking trainer behind Channel Ten’s ‘The Biggest Loser’, but Michelle Bridges has become one of Australia’s most influential personal trainers and fitness influencers. With over 20 year’s experience in personal training, Michelle has published 11 bestselling books and launched the highly successful Michelle Bridges 12 Week Body Transformation online program. Michelle is the current ambassador for The Australian Institute of Fitness, Medibank and RSPCA QLD, she’s also worked with brands including Big W, Holden and Woolworths. Michelle has recently joined the team at Body + Soul writing a monthly column, and also regularly appears in many other publications such as Prevention, Women’s Health, The Australian Women’s Weekly, Woman’s Day, Good Food and WHO. In 2015, Sam Wood, 34-year-old owner of ‘The Woodshed’, Australia’s largest personal training studio in Brighton, and founder of children’s fitness company Gecko Kids was announced as The Bachelor. He met his partner Snezana Markoski on the show and since then has developed his own lifestyle program, 28 by Sam Wood. The program includes quick, simple, delicious meals with a daily 28-minute exercise program. His aim is to show Aussies that good nutrition & exercise shouldn’t be stressful or complicated. Sam has recently become the new ambassador for Weet-Bix Blends. Sam has also worked with brands including Asahi, Bakers Delight and Hello Fresh. Sam is a writer for lifestyle.com.au sharing his workout tips and top meals, and has also shared these with publications such as kidspot.com.au, Yahoo7 Be and Mamamia. Tim Robards became a household name when he starred on The Bachelor in 2013, since then Tim has become known for much more. Tim is a Chiropractor, human biomechanics enthusiast, TV personality/speaker and Inspired Educator in Health & Wellbeing. Tim has also launched his own fitness program, The Robards Method. TRM is about simplifying the approach to optimal health so people can live an inspired, fun and active life. Tim shares workout and fitness tips, as well as recipes with his followers. Tim is currently an ambassador for Deep Heat (a FORWARD client) Jeep, ALDI, Thermomix and Swisse, and regularly works with fashion brands including MYER, Hugo Boss, Calvin Klein and Calibre. He has previously worked with brands including Fitbit, Giorgio Armani, Westfield and NBN. He also regularly contributes to range of health and fitness publications, including Men’s Health, news.com.au and Yahoo7. Personal trainer to the stars, Andrew ‘Pap’ Papadopoulos, is a self-confessed fitness junkie and endurance athlete, as well as the owner of Battle Fit Australia. After spending time in the Australian Defence Force, Andrew started Battle Fit Australia – a way to simulate military training, but with his own creative twist. Andrew is an ambassador for SKINS, Performix, ANKORR & AUSFIT Torsion Bar, and has recently worked with brands such as The Athletes Foot, You Foodz and Isowhey. Andrew is also a contributing writer for GQ magazine and has previously shared his fitness tips with Sporteluxe, Body + Soul and Australian Men’s Health. She’s a stay at home mum with four children and one of the world’s most popular health and wellness motivators, but Dani Stevens shows no signs of slowing down. Dani’s fitness philosophy is that having children or a busy lifestyle, should not require you to sacrifice a healthy existence. Dani is also the author of e-book, ‘30 Days of Fitness & Food’ which includes a range of recipes and workouts designed for the time poor. She also has a successful blog called website Fitness Food and Style. Her blog and social channels feature weekly motivating weight-loss success stories, monthly challenges to keep followers motivated and regular recipes and activities to keep followers consistently checking in. Dani is currently an ambassador for American Express and has previously collaborated with Jamie Oliver, Volvo, Telstra Dr Oz, FORWARD worked with Dani for Thermos. With Australians becoming more health conscious, health, nutrition and fitness brands will continue to grow and need to develop strategies to obtain and retain market share. The importance of being able to identify current, as well as up and coming, influencers that align with particular brand values, campaigns and messaging is more important than ever. If you would like to know more about how your brand can benefit from working with influencers like these, please get in touch with the FORWARD team.